Sometimes I am blown away by my mother’s brilliance when it comes to developing recipes. One thing you have to know about my mother and I, we love talking about food….. WAY more than any normal person. I was staying with my parents last weekend so I could attend a blog conference near by the following day. As we were brainstorming recipes, she came up with this incredible idea. The simplicity blew me away, but the flavor… the flavor was unbelievable. My dad claimed this to be one of his new favorite dinners. Try it out for yourselves. The cream cheese, feta and mozzarella cheese combo is so wonderful. Each and every bite is jam packed with flavor. The flavor in this dinner will completely blow your mind! It is one of the best things I have ever eaten! Unfold sheet of puff pastry onto a lightly floured surface. Spread softened cream cheese evenly over pastry sheet leaving about ½ inch space along the edges. 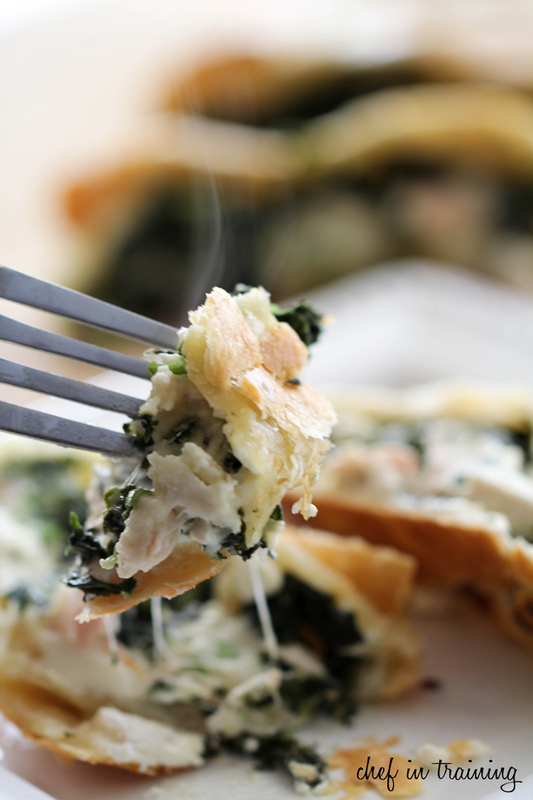 Evenly distribute the drained and thawed frozen spinach over ½ of the puff pastry sheet (width wise), again leaving about a ½ inch space along the edges. Next, evenly distribute chicken and green onions over the spinach, still saving that ½ inch space around the edges. Lastly, evenly sprinkle crumbled feta and shredded mozarella cheese over the top of the chicken, still leaving a ½ inch space around edges. Fold over the half of the puff pastry that doesn't have the ingredients on it and seal edges nicely and tight. Let your mom know that this was a fantastic idea! All of those flavors together in a pocket?! O how amazing is that going to taste! I'll be trying this soon! It's sooo cold in Chicago today, those pockets would totally warm me up. They look really really really good! Nikki, I have loved all of your Greek recipes., and this one looks like another hit! Your picture has me drooling! I will make it tonight and let you know how it turned out. Thanks! Oh my God, some of my favorite flavors ever. Of course, my roommate does all of the cooking so first I have to convince her she wants to make this. Shouldn't be too difficult because it looks delicious! Wonderful recipe!! It' so simple and looks so amazing! Those are literally some of my most favoritest (a new word, you're welcome) flavors! Can't wait to try this!! It looks absolutely delicious!!! Thanks to your mom for the awesome idea!! these are my hubbies favorite flavors! These were delicious! As you said, the combo of the 3 cheeses is devine. I made them slightly different. I just combined all the ingredients together, cut the pastry into circles and put them into muffin tins, filled with the chicken mixture, then covered each one with another smaller circle of puff pastry, pinching together to seal the edges. Once baked they come out as little chicken pies. This recipe is a keeper. Do you reckon I could use fresh spinach? I hate draining the frozen stuff, I can never get all the water off and things get mushy. Sounds and looks delish! I made this tonight and the whole fami,y loved it! Thank you! In the U.S., green onions are what are known as scallions in other parts of the world (or I believe they're called spring onions in Europe). Shallots are in the onion family too, but they're much different than green onions. Saw the recipe a week or two ago and made it tonight. 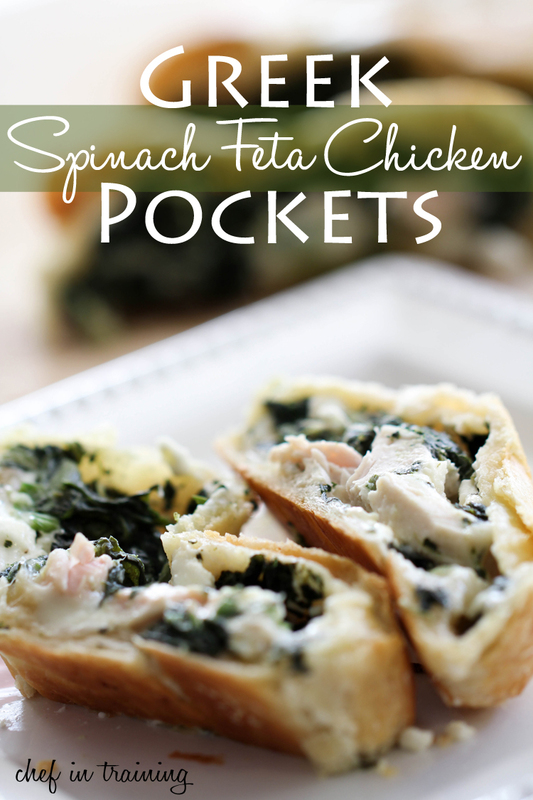 Very easy to make and yummy! Next time I think I will use fresh spinach as I prefer the taste. Also added garlic when I cooked the chicken. Thanks for the recipe. I am so glad I discovered your blog! Making this tonight, can't wait to taste it! I made this tonight for dinner and it was excellent! My kids devoured it! So easy! Used Tenderflake puff pasty, rolled it out and great for leftover chicken. Great recipe! Thx! Made this tonight and it is very good. I used leftover boneless skinless chicken thighs that I had previously marinated in a Greek marinade and cooked on the grill. I found the ingredients way to much to try to fit on 1/2 of a pastry sheet and be able to pull the other 1/2 over, so I used both pastry sheets in the package ... one on the top and one on the bottom, and pinched together the edges. If using 1 sheet, I'd cut the ingredients in half. I also lined a baking sheet with parchment paper and prepared it right on the sheet and baked it. The pastry didn't stick to the parchment paper at all. I will definitely make this again. These were delish! I cut out the cream cheese and added tomatoes and some cucumber-awesome dinner!